Otters have playful personalities both in the wild and in captivity. Otters are known for being easy to train to do certain tricks, and have many natural habits that endear them to humans. Otters are known to carry a favorite rock or pebble in their pouches, and often fall asleep floating in the water holding paws with another otter in order to not drift away. Otters are generally considered to be fuzzy, adorable, and generally a joy to watch. Observers of otters will notice that they respond much as one would expect to unexpected situations in their immediate environment. Otters each have their own specific personalities which lend an air of character to each individual creature. Like humans, otters may react and interact differently in a variety of situations. 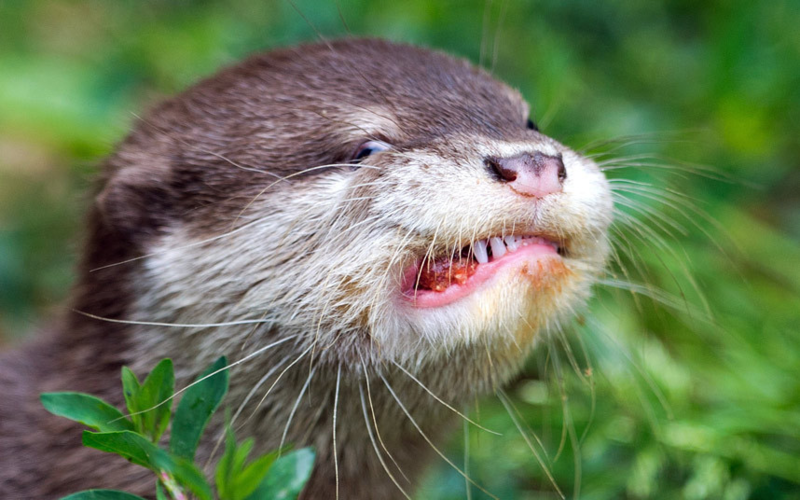 When given a succulent meatball this otter murgeons at the photographer. The word murgeon is a verb meaning to grimace at, or to make faces at a person. The otter murgeoning is a funny example of an animal tasting something they aren’t familiar with, like a puppy licking a lemon or a cat stealing a bit of watermelon. Otters, like other animals, can make a great number of faces, each displaying a different feeling or emotion. An otter murgeoning can give us a great insight into this spectacular little creature. The word murgeon was adapted into the English language from a dialect of Scottish English. The word became used after a politician, Lord Roy Jenkins of Hillhead, supposedly revived a few obsolete Scottish words in his political campaign and speeches. A newspaper lampooned his choices, but the word murgeon stuck. The adorable otter will certainly remember its first experience with a spicy meatball, and its murgeoning face will stay in the minds of those who observe it for much time to come.